Long ago, the British Isles were not isles at all. Britain was part of the European continent: the English Channel did not exist and East Anglia merged into the Netherlands. Then, about 10,000 years ago - when the last Ice Age had ended, when the bones of the last mammoth had sunk into the mud of the Thames valley, when the climate grew warmer - new rivers and seas were formed and Europe was slowly formed into its present shape. 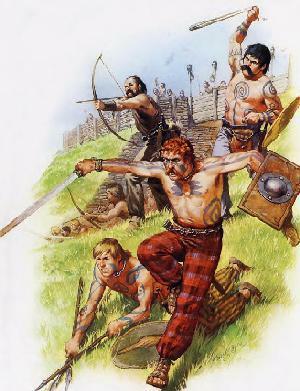 The people of Britain, like their cousins оn the continent, were simple hunters who lived оn the flesh of wild animals, which they shot with flint-tipped arrows or caught in traps. They killed fish in the estuaries and shallow rivers with spears made from the antlers of deer. They gathered wild fruit, nuts and honey, and probably ate snails, caterpillars and other grubs. They did not build permanent houses, but moved from place to place, sheltering in caves in cold weather. The people of Britain lagged behind the people of certain warmer lands in their development. While they were still living in caves and scratching about for insects to eat, the Egyptians were building pyramids and writing literature. Of all the stages between the cave and the skyscraper, perhaps man's greatest leap forward was taken when he became а farmer. The Stone Age farmer of about 5,000 years ago had to clear patches in the forests which covered most of Britain that was not barren heath or swamp. Не cut down trees with stone axes, burned off the scrub, and tilled the ground with а stone-headed hoe. Не kept half-wild cattle and pigs in the forest, where they could find their own food, and in treeless parts, like northern Scotland, he kept sheep. The people who grew grain in southern England had flint sickles to reap the harvest. На сайте появился раздел "Песни". В каждом анонсе выводится видеоклип в уменьшенном окне. Для перехода к странице, на которой расположено стандартное окно с клипом и текст песни (обычно с русским переводом), нажмите на ссылку Полный текст сообщения под клипом.